Comments: This species was formerly known as the Olivaceous Cormorant. Neotropic Cormorants are more common in the southern Great Plains although they are being found with increasing frequency in the northern plains. 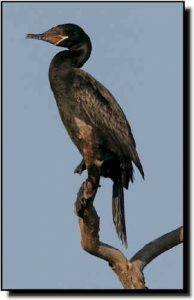 They can be distinguished from other cormorants by a white outline around the gular pouch and base of the bill. The gular pouch appears triangular rather than rounded as in Double-crested Cormorants. Tails are long, approximately the same length as their necks. Neotropic Cormorants are noticeably smaller than the more commonly seen Double-crested Cormorants. During the breeding season, males acquire a head tuft and scattered plumes on the head and neck. Immatures are browner than the adults.